Economists at the bank that is the largest by size and by dairy lending expect Fonterra will downgrade its milk price forecast next month from the current $6.75 to possibly as low as $6.25. Fonterra always updates its farmgate milk price forecast before Christmas, normally in the second week of December. The prediction from the ANZ economists of a lower milk price forecast follows another weak performance in the GlobalDairyTrade auction overnight, in which prices slipped for the fourth consecutive auction. And ASB economists, long-time 'bulls' about the milk price, have lowered their forecast price for this season to $6.50 from $6.75 previously. ASB senior rural economist Nathan Penny said October was a good month for NZ production. "So good, in fact, that NZ production has rebounded sooner than we expected from the very wet weather (we had expected the rebound to come over the summer and autumn). Nationwide production (i.e. for all processors) for October lifted 2.9% compared to October 2016, after August and September had been well behind 2016 levels. It seems that NZ weather and thus production can turn on a dime. "With NZ production much-improved and EU production already firm, we factor in this better global production outlook into our milk price forecast. All up and along with the weak run of recent auction results, we trim our 2017/18 milk price forecast by 25 cents to $6.50/kg." In the overnight auction (which incidentally was GDT's 200th such event) overall prices as measured by the GDT Index slipped 3.4%, with the average price per metric tonne falling below US$3,000. The key Whole Milk Powder price slipped 2.7% to US$2,778, while Skim Milk Powder dropped 6.5% and the recent star of the show butter fell 5.9%. The WMP price is now some 11% lower than it was in mid-September, while overall prices as measured by the GDT Index are down nearly 10% - though it's certainly relevant too that the Kiwi dollar is down over 6.5% against the American currency over the same period, so there has been some offset for farmers. ANZ senior economist Philip Borkin said weakness at the overnight auction "was broad-based". On WMP prices he noted that there were similar-sized falls across "the curve" - the various contract durations from near term delivery (December, which was down 4.5%) to next April (which dropped 2.9%). "In fact, with the exception of the most near-dated contract, forward prices are now all below US$2,800/tonne," Borkin said. "It is clear the market is nervous about rising global supply. "European supply is increasing on the back of higher farmgate prices and favourable seasonal conditions, and local supply is improving too. "It is our expectation that WMP prices find some support around this level, although one of those reasons is that WMP was looking cheap compared to a SMP/milkfat combination, and that relativity closed a little at this auction. "Ultimately, it sets the scene for Fonterra to downgrade its milk price forecast for 2017/18 early next month to close to our current forecast of $6.25-$6.50/kg MS," Borkin said. 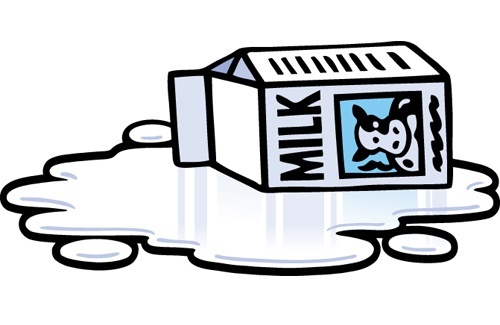 "US dairy glut leads to problem of spilled milk in some markets"
Whatever happened to all that WMP what Fonterra was storing in warehouses all over the place? Are New Zealanders now getting it as reconstituted 'fresh' milk in the supermarkets? Because it sure seems to go-off quickly, and without a smell, and as chunky fibres at the bottom of the cup. I guess if the stored stuff is approaching its use-by-date, then giving it to us is one way of using it! 'chunky fibres at the bottom of the cup' - you really need to report this to the manufacturer. Fonterra's inventory at the end of last season wasn't as high as you might think. Anything getting close to use by date usually goes in to stock feed. Does the ingredients on your milk bottle say reconstituted milk? Blue top in my fridge says 'Fresh Milk'. I dont understand why the regular punter seems to think Fonterra would go to all that trouble of making powder to then chuck the water back in. However if it is getting old, or was out of spec as you say Cas ob it makes reasonable cmr calf milk replacer. Apparently a tonne of cmr is worth more than a tonne of human grade wmp. I have just been checking my rainfall totals. We hit our annual average about 2 months ago. Now we are running well under the monthly averages. La nina...usually a sod of a season here ;-( I suppose there could well be an upside to the dairy price yet if she continues to go dry. Interesting bw. I use Anchor Trim - MOTH uses the blue top, and I have never had what you describe happening with it. Living in a previous area we bought our milk from a very small rural coastal town supermarket. We did have some issues at various times - noticeably during a hot weather period - with the milk. Contacted Fonterra and it turned out that when it was delivered to the supermarket in the warm humid hours of early morning, it was just left outside until supermarket staff came to work. So it wasn't kept at cool chain temp at all times. Agreement was reached to change the delivery system and there wasn't an issue after that. Call Fonterra - I would be interested in their reply.